1. 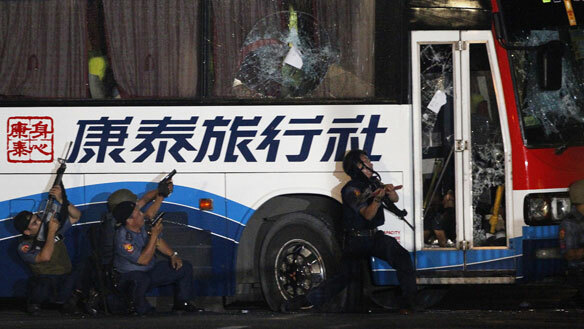 August 23, 2010 - The world renowned bus-hostage drama in Luneta Park. Turned out to be an hours (literally hours - more than 12 hours) of action-heart breaking story. 2. Barely one year when SWAT trended the social networks and topped the headlines for it's new name: Sorry Wala Akong Training, Sugod Wait Atras Tago, Sana Wag Akong Tamaan et cetera. 3. Apology! Hong Kong government seeks for an apology. But, Malacanang says: "Sorry, we can't afford to say our apologies!" 4. Malacanang sends it's sole apologies: PNOY won't be able to hear the solidarity and peace mass held at Luneta Park in commemoration of the hostage tragedy. He will be busy attending the newest 46 year old Philippine naval warship expected to glance the Philippine seas today from California. haha! i remember this one! whew.. i hope there's no such thing that happen again in our country... whew! yeah... SWAT definitely don't want that to happen again... They're still in training..